Emaar’s The Tower at Dubai Creek Harbour is expected to be more than a brick-andmortar addition to a world crammed with the usual concrete suspects. According to Santiago Calatrava Valls, the famous Spanish-Swiss neofuturistic architect, structural engineer, sculptor and painter, who is helming the project, it will be an “inspiring and usable” monument that will stand the test of time. The Tower, if reports are to be believed, will go toe-totoe with the Burj Khalifa, the world’s tallest skyscraper. “We have invested all our heart and inspiration in creating what we believe will serve as a landmark across time. Through this we are delivering a message to this generation and those that will follow that we believe in hope, progress and discovery,” says Calatrava Valls. The design draws inspiration from the lily and evokes the image of a minaret, a distinctive feature of Islamic culture. The elongated, ovalshaped bud and geometric texture set the template for the observation decks. The slender stem serves as the analogy for a structure that has been engineered to its most efficient diameter. The minaret is anchored to the ground with sturdy cables, which are in turn inspired by the delicate ribbing of the lily’s leaves. The structure’s strength is derived from the technical precision involved and modern engineering materials that have gone into its construction. which while being a testament to this age of cutting-edge technology, will also be seen as a piece of incredible art,” says Calatrava Valls. While the tower’s bud will serve as a beacon of light at night with the core and cables illuminated, the Pinnacle Room will offer the opportunity for stargazing. The observation decks are inspired by the Hanging Gardens of Babylon and glass-enclosed balconies will rotate outside the skin of the tower. “We’ll have areas close to the core, but after a certain point the core stops, then we have the whole surface of the tower to create beautiful observatory platforms with 360-degree views. This is a novelty in this region,” Calatrava Valls explains. and seismic testing will ensure that it stands the test of time. Green regulations will also be adhered to. 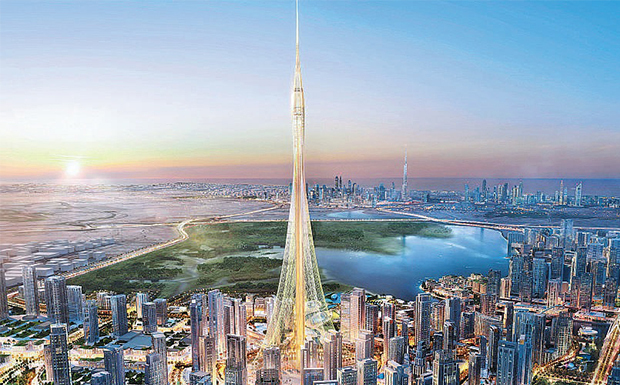 Mohamed Alabbar, Chairman of Emaar Properties, admits creating something as spectacular as The Tower is possible because of the support of the emirate’s leadership. “[Our leaders have] motivated us to push the boundaries to achieve something that is truly special not just for the city and its people, but also for the world in general,” says Alabbar. Work on the building is expected to start this summer and be ready by the time the World Expo 2020 rolls into Dubai. “We’ve already started mobilisation at the ground level, piling work could start as early as June,” says Alabbar. However, he didn’t go into details about how much higher The Tower would be compared with the Burj Khalifa. The building will also house a boutique hotel. “We’ll probably have around 18-20 usable floors comprising restaurants, hotel function rooms, gardens and observation decks,” says Alabbar. The Tower will feature links to a 4.5km boardwalk and the retail district. The Dubai Creek Residences, Creekside 18, and Harbour Views, projects that are taking shape in the Island District, will be among the properties that will get a clear, unrestricted view of The Tower. It will cost around $1 billion (Dh3.67 billion) to build. The developer plans to fund half the amount from its own resources. “The company has resources, we’ve done our own financial and revenue mode checked by external financial consultants who have said that the 50-50 equation is a very comfortable option,” says Alabbar. The residential properties will play a significant role in boosting the revenue model. “People all over the world love living around beautiful monuments and they are willing to pay a price for this beauty,” says Alabbar. Spread over six sq km, The Tower at Dubai Creek Harbour will be just about double the size of Downtown Burj Khalifa, but it isn’t about outdoing the other. “Downtown is what we built our credibility with and we’re very loyal to it, but we need more space,” says Alabbar. “If you go there, you can tell by the volume of traffic and activity that the area has reached its capacity and we’re close to finishing the last few buildings there.